Hinky Dinky News Vol. 22, No. 4: July-August, 1966 – Hinky Dinky Parlay Voo? 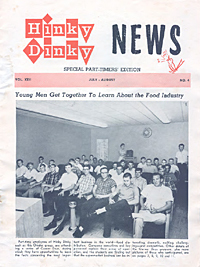 Here’s the second installment of the Hinky Dinky News pdf files. Why only “young men” at the meeting? Where are the “young women”? Note the ashtray present in front of the gathered crowd. You wouldn’t see that today. Read the spoeech given by CM “Nick” Newman to a gathering of parttime HD employees…….quite inspiring for 1966 and much of the content is applicable to today—43 years later.